What I learnt through consciously deciding to commit to my own health. My biggest weakness is my weight over the last couple of years and it really showed being with my partner in a 7 and a half year relationship, the photos over the years of us together really showed how much I struggled with my weight. 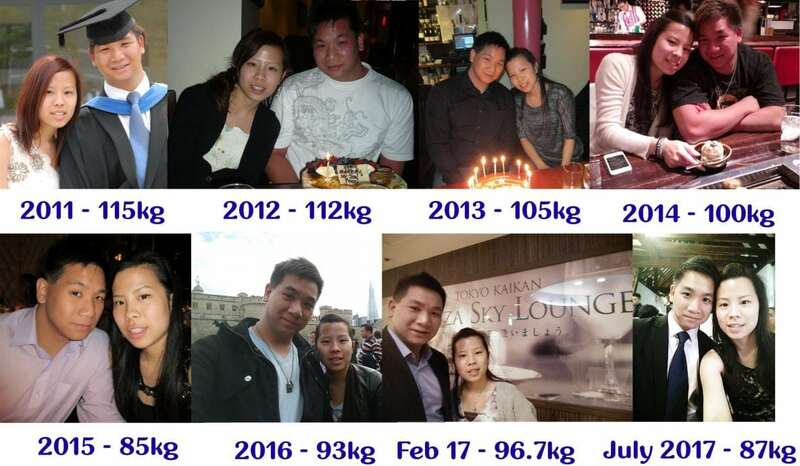 At the start of the relationship, I was 115kg (18 stone). Now I am at around 87kg (13.7 stone) and in between, I have been going up and down in my weight. It really got to the point where I just got tired of being tired, lethargic, low on energy and burning out quickly from working and that contributed to holding me back energetically from creating what I love. What made it really uncomfortable for me to realise was when I sat down at the table and I would have this belly just lodging in between me and the table. Once I got to that point, I decided to look into nutrition and find a coach that got the results I wanted, learning what he did and what was his routine, techniques and strategies to help achieve what I wanted. Focusing on my health and heading to the gym on a regular basis has helped me realise even more that everything you want in life never comes easy. It takes time, dedication, sweat, commitment and tears to get the things you want in life. It’s never easy but it is worth it. The learning I got from going into the gym consistently gave me the results I wanted, I started to see changes in my body, getting more lean and looking less chubby! But what I also noticed was the progress I was making inside the gym. My coach said you can’t track what you don’t measure, this goes for anything in life too, business, sales, calories, reps etc. I started writing out my work out each time I head in with the sets and the weights and my aim for each workout is to increase my weights that I do in the set. I started off quite conservatively at first with the weights I felt comfortable with, then I started to notice how I limited myself when I increased my weights because I thought I wasn’t able to lift that weight. That’s the limiting belief that I have been putting on myself to limit my growth and progress. Each time I increase my weights, the more I saw how much I have been limiting myself. Of course, it got to the point where my body wasn’t able to lift or push what my body wasn’t capable of and now it just goes down to consistency and nutrition on getting stronger and moving up. Yes, there are days where I just don’t feel like going to the gym because I feel tired or parts of my muscles are aching. However I still choose to head out of the gym because I know how you do something is how you do everything and it reflects in all areas of your life whether it’s in career, finance, business, relationships, vocation or health. You get what you put in, if you want more results, you have to put more effort in. Now, in what areas of your life have you been limiting yourself that you can’t have what you want because of the story that you have been telling yourself? You can’t do it or don’t know how so you never got started in the first place? Your success isn’t about what you do now but has to become a way of life. When your health becomes a way of life. Naturally without you even trying, you become stronger, healthier, leaner, fitter. When you put that into anything in life, growth, scale, leadership and everything you want right now is hiding behind the way you live your life. Knowing it and living it is completely different. Do you live it? Do you Embody it? Do you Practice it? Do you surround yourself with people who hold you accountable to a standard where you apply it? Not every month or once in awhile but every day? It is about making good habits permanent that it becomes a way of life. Live Life With No Limits!